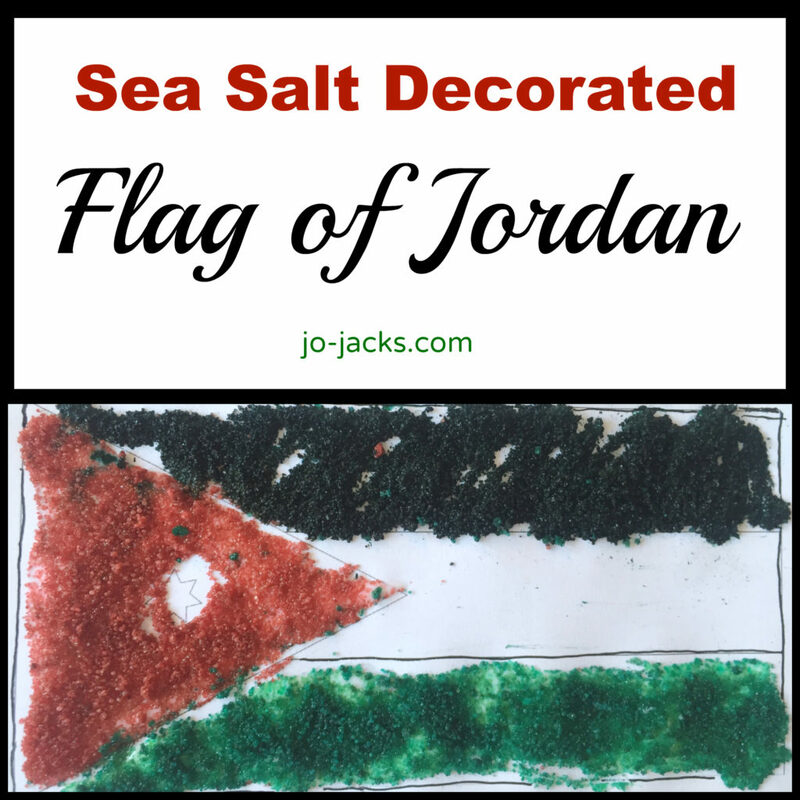 This is a quick and easy craft for children to compliment our amazing family travel to Jordan – a flag of Jordan craft using colored sea salts. One of the activities we did while on a family vacation in Jordan was float in the Dead Sea, and rub the mud from there onto our skin. The dead sea is the saltiest water on earth. 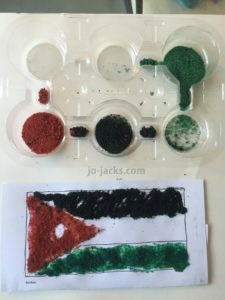 So I thought that for decorating the flag of Jordan, what better material to use than salts? 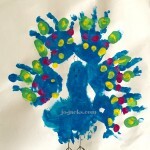 Flag of Jordan printout – I used this one: flag of Jordan outline. Step 1. 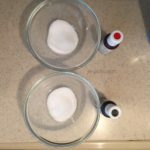 Dye and dry your salt. 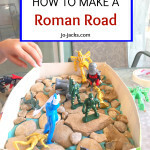 I followed this tutorial from Babbledabbledo. Step 2. 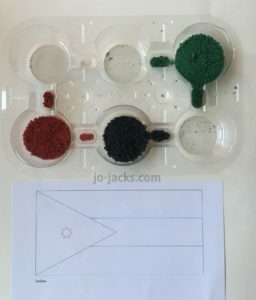 Using the glue, add colored salt onto flag. A great explanation of the meaning and history of the Jordanian flag can be found here. The 7-pointed star in the middle of the red triangle represents to 7 pillars of Islam. Jordan is a majority-Islam country and Islamic teaching is at the heart of their national identity. The red, black, and green represent the tribes/dynasties that have ruled the area for centuries. 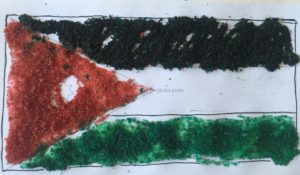 The flag was created in the 1920s when Jordan was formed as a country – coming about after the Arab revolt during WW1 against the Ottoman Empire. 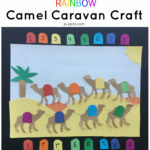 Although this is not at all a child’s book, I highly recommend reading Laurence In Arabia to better understand the Arab revolt against the Ottoman empire during WWI. It is fascinating to learn how the various tribes united for an Arab resistance, the risks they faced, and the double-crossing they dealt with working with the allied powers. Much political tension in the Middle East now can be traced back to this time and the some-what arbitrary placement of borders that occurred.